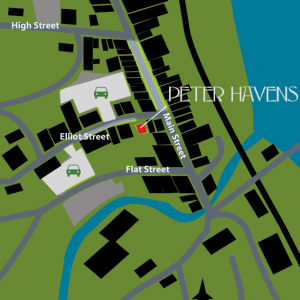 There are three parking options less than a block from Peter Havens Restaurant. All three are marked on the map above. Harmony Lot : This pay-and-display lot has an entrance directly across from the restaurant. The parking garage in the Transportation Center: The parking garage is half a block west of the restaurant and on the same side of the street. Note that the garage is on Flat Street below but there is an entrance at street level on Elliot Street as well. On-street metered parking along Elliot Street. Parking note: Town parking meters and pay-and-display requirements are enforced until 6 PM from Monday through Saturday. If you arrive before 6 PM on any day but Sunday, please remember to feed the meter or purchase parking from the pay-and-display machine. Take exit 2 and turn left at the end of the ramp onto Western Avenue in Brattleboro. Continue down Western Avenue and bear right at the fork onto Green Street. Continue down Green Street until it forks again. Take the right fork onto Elliot Street. Turn left onto Elliot Street. Peter Havens Restaurant is in the middle of the block on the right. Follow Route 9 to Western Avenue in Brattleboro. Continue down Western Avenue and bear right at the fork onto Green Street. Continue down Green Street until it forks again. Take the right fork onto Elliot Street. Turn left onto Elliot Street. Peter Havens Restaurant is in the middle of the block on the right. Proceed along Route 5 until you reach Main Street in downtown Brattleboro. Turn left onto Elliot Street. Peter Havens Restaurant is in the middle of the block on the left. Proceed along Route 5 until you reach Main Street in downtown Brattleboro. Take a right onto Elliot Street. Peter Havens Restaurant is in the middle of the block on the left. Proceed down Route 30 to Linden Street in Brattleboro. Continue onto Main Street about a quarter mile to Elliot Street, just past High Street and the River Garden. Turn right onto Elliot Street. Peter Havens Restaurant is in the middle of the block on the left.